With elegant styling the CorningWare French White Round Bakeware Set brings the convenience of baking and serving in one dish. 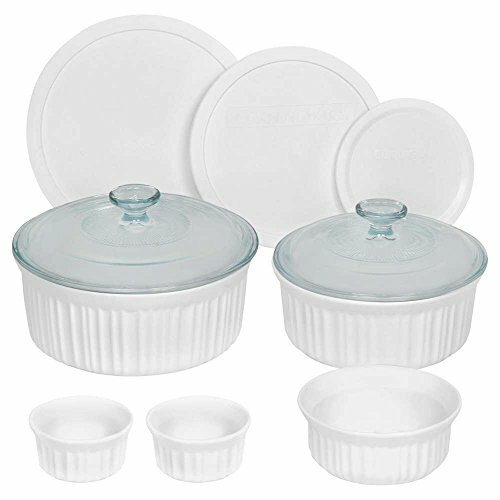 CorningWare French White Round Bakeware set includes one (1) 2.5-quart round baking dish with glass and plastic covers, one (1) 1.5-quart round baking dish with glass and plastic covers, one (1) 16-ounce round baking dish with plastic cover, and two (2) 4-ounce ramekins. With its classic, fluted design, French White oven-to-table bakeware imparts a traditional elegance that is a perfect complement to any decor. Chip- and crack-resistant, each stoneware piece is safe to use in the microwave, oven, refrigerator, freezer, and dishwasher. Non-porous surfaces do not absorb food odors, flavors, or stains. Set comes with a 1-year warranty.